Artega present at the Frankfurt Motor Show 2015 with a new electric sports car called 'Scalo' after long sleep periods. 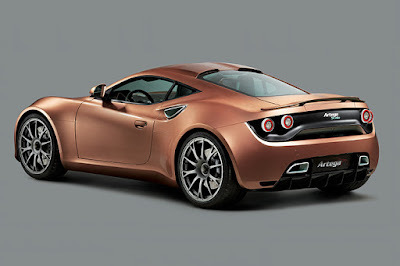 The car that was launched as a direct successor of Artega GT. 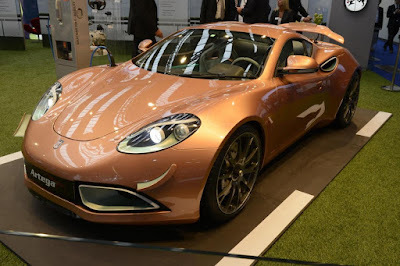 And Scalo EV has a carbon composite body with an active rear spoiler and using four 20-inch alloy wheels. The car production will be limited to 12 units. The styling is nearly identical to the GT model, but Scalo has a number of small modifications including a carbon fiber front spoiler, revised air intakes and active aerodynamic canards. In the interior of this car is very familiar with the features of modern technology including digital instrument cluster and smartphone wireless charger. This model also has a multifunction steering wheel. The car also has an infotainment system and audio system with 13 speakers. There are also "synthetic engine sound," a system that generates fake engine noise both inside and outside the vehicle. 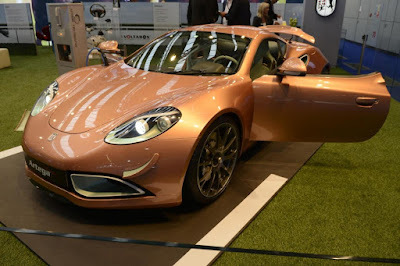 As reported by the Worldcarfans on Thursday, September 17, 2015, the power of Scalo EV supplied by the 37 kWh lithium-ion battery that have a power of two rear-mounted Voltabox electric motors that produce maximum output combined power of 402 bhp (300 kW) and 575 lb-ft (778 Nm) of torque. This allows the Scalo EV to accelerate from 0-60 mph takes only 3.6 seconds, breaking an electronically limited top speed of 155 mph (250 km/h) and can travel up to 250 miles (402 km) on a single charge of the battery.